by Dr. Racho Donef — Sydney, Australia. August 28, 2003. In 2000, in a conference on the Assyrian genocide, I had delivered a paper on the Assyrians in Turkey, entitled, “Assyrians in Turkey: Disappearance of a culture?” Despite the pessimistic title of my talk I had concluded that in the last few years some improvements in the way the authorities view the Assyrians have been noted. The main reason behind this seemed to be a drive towards attracting tourists to such areas of Turkey as Tur'Abdin, where normally not many tourists go. There were two key developments in the ensuing period. One development was the case of father Yusuf Akbulut, a Syriac Orthodox Priest serving in Diyarbakir, in Turkey’s South East, and the other the Turkish National Intelligence Agency’s (MIT - Milli Istihbarat Teskilati) report on the Assyrians. I have extensively written about both issues and these articles can be readily found in the Internet. In summary, Yusuf Akbulut from Diyarbakir was charged with inciting hatred for his declaration that the Assyrians were also subjected to Genocide in 1915. He was later cleared of those charges. The MIT report on the Assyrians was commissioned by the National Security Council (Milli Güvenlik Kurulu - MGK). From the parts of the report that was published it was possible to draw the conclusion that the (MIT) monitors Assyrian and other websites that publish information about Turkey. Despite the promises made by Ecevit, the Assyrians continued to be viewed suspiciously by the various authorities of the State. The Turkish National Grand Assembly’s (TBMM) Human Rights Commission, issued a report describing the Armenians and the Assyrians (Suryani) as a threat to the unitary structure of Turkey. Other than the perceived threats to Turkey’s unitary composition from the Armenian and Assyrian community, the report also states that from the 60,000 Assyrians registered in Mardin only 2000 live in the area. The others who live in Europe are now buying property in Mardin at an “alarming rate”, according to the report. Why would it be alarming, it is not very clear. Why is it that 58,000 Assyrians from Mardin have been forced to leave their country? Do not people who lived in Turkey for centuries and are Turkish citizens have the right to buy land in their country? The author, Resul Tosun, from the Islamist AKP, MP representing the city of Tokat, and member of the TBMM Human Rights Committee stated in the report: “let the Suryani benefit from all kinds of human rights but we recorded these developments so the state remains aware”. The underlying message seems to be that “you may want to come back to Turkey but we are watching you”. The two reports - MIT and TBMM - suggest that the state is finally recognising that there is such issue as the Assyrian Question in Turkey and is moving towards formulating a strategy to address it. However, the existence of an Assyrian desk in the Foreign Affairs Ministry and these two reports indicate that Turkey views the Assyrian Question as one involving foreigners, rather than one involving an indigenous minority. Murat Süleyman Erdem, advisor to the Mayor of Midyat, Turabdin, criticizes the report and points out that an MP who has no familiarity with South East Turkey wrote it. He also observes the negative local attitudes Assyrians are facing in trying to return and invest in their homeland. Some Assyrians who believed Ecevit’s assurances, that they be safe to return to their homeland, were sadly mistaken. “Many Assyrians/Syriacs have travelled to Turabdin to seek the possibilities to recover their occupied property.” Those who returned to their villagers were assaulted and beaten by the Turkish Village Guards (korucu) of the Turkish Security Forces. The Association of Chaldean, Syriacs and Assyrians (ACSA) in Sweden provides the example of the Haidari family of Assyrian origin who tried to get help from the police in Midyat, to recover their property. When the Haidari family the left the police station on 24 of September 2002 were assaulted and heavily beaten in central Midyat. 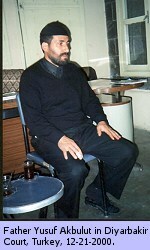 Also, on 26 April 2003, Nuri Demir was mistreated by the village guards when he sought his property from the illegal occupiers. A number of Assyrians returned to their village Kafro from Switzerland and Germany. In 1995, the remaining Assyrian three families were forced to leave their village under threat by the military. The “Kafro Development Association” established to facilitate the return of more than 70 Assyrians from Europe and aims to make the village liveable again. In a sense, this is a test which, if succeeds, it may reverse the trend of the Assyrian migration to Europe which started in the 1960s. In a parallel development, in the Greek community in the Turkish Aegean island of Gökçeada (Imvroz), some autochthonous Greeks also returned to start rebuilding their houses. Others from the same island return once a year, in August, for holidays, adopting a wait-and-see approach before they consider their next move. The improving Greek-Turkish relations no doubt facilitated this trend and it is also clear that the Turkish Government realised the potential benefit to the Turkish economy in terms of investment and tourism. Furthermore, Turkey’s desire to enter the European Union also affected policy and attitude towards minorities. Nevertheless, the incidents stated above would suggest that this return is unlikely to be a smooth process and there is also a danger that what the Christian minorities build for the second time will be confiscated or destroyed again in the future, unless Turkish society undergoes a radical change. A delegation from the Assyrian Federation in Sweden (Assyriska Riksförbundet i Sverige- ARS) visited Ankara in June 2002 and met with Turkish authorities including the National Security Council. Various Turkish authorities met the Assyrian Federation and expressed their willingness to discuss the ongoing situation of the Assyrians in Turkey and the relations between Turkey and the Assyrians in Europe. There was one other encouraging development, in this three-year period in question, with the changes in the Pious Foundation Laws (Vakiflar Kanunu). In the Bill on Pious Foundations was stated that “[i]n our country there are four non-Muslim [communities] which fit to this description [of minority]: The Greek, the Armenian, the Jewish and the Assyrian communities”. It was worthy of note that in the Bill the Assyrians are viewed as “minority”, whereas as a matter of policy Turkish authorities deny that the Assyrians are a minority, citing the Lausanne Agreement. The minority status confer some rights including the right to establish schools and teach in the native language of the community. The Bill itself does not grant minority status to the Assyrians and it remains to be seen whether this right would be conferred to the Assyrians. The “Directive on Foreign Schools”, formulated in 1953, carries a prohibition on minority schools on opening branches or even increasing the number of classes. With the new Law on Pious Foundation which was passed by the TBMM, these schools will be able to acquire property and set up branches. There are 5,700 pious foundations administered by the Directorate General of Foundations, which were all remaining from the Ottoman period. According to Zaman’s article quoted above, 10 Assyrian pious foundations are recognised in Turkey. However Murat Cano, a lawyer specialising in minority rights identifies six pious foundations belonging to the Suryani community. Although, the Assyrians are not able to teach Syriac, around 70 students receive religious instructions in the monasteries of Mardin and Midyat. Nonetheless, as if to prove the adage “the more things change the more they stay the same”, the Turkish Ministry of Education on primary and secondary schools issued a circular and schools, including minority schools, to organise conferences and ‘testimonials’ attesting that the Armenians, Greeks and the Assyrians have never suffered extermination in Turkey. The students are urged to write essays on the theme of the ‘battle against allegations of genocide’ and use such expressions as ‘massacres perpetrated by Armenians’, and presumably by Assyrians. Such expressions as ‘the Turks may have killed Armenians’ are not to be used in these essays. This, what could be only described as ‘primitive approach’ to genocide denial, will force minority schools, Greek and Armenian, and Assyrian children in Turkish schools, to participate and deny their ancestor suffered any massacres and that it was their brethren who committed atrocities against the helpless Turks. No democratic nation can incur such cruelty to its school students. A member of the European Parliament, Arie M Oostlaner, has drafted a first report on Turkey’s application for EU membership and called upon Turkey to respect religious pluralism and protect national minorities (Provisional report on Turkey’s application for EU membership calls on protection of minorities, 23 April 2003). Mr Oostlaner considers that a place should be created for indigenous and liturgical languages, such as Aramaic/Syriac, and asks that Turkey lifts the de facto occupation of Kurdish and Syrian Orthodox villages by armed village guards. Whether the recommendations pertaining to Assyrians would be fully implemented it remains to be seen. The government may be sincere in its pledge in relation to Assyrians, although I strongly doubt it. Furthermore, it needs to change its ad hoc policy on the Assyrians and implement a liberal program which will permeate to the local levels where Assyrian live. In other words, it is not sufficient to make vague promises in Ankara but then at local level, mayors, village guards, traditional authorities (aghas, sheiks and muhtars), the police, the army do as they please. There is also another dimension to the Assyrian Question: the role of the mass media. For years the popular media publishes articles, which incite hatred of minorities. The latest example is that of Özdemir Ince, who in a series of articles published in Hürriyet this year (April to July), denies the Assyrian genocide and vilifies the Assyrians with extraordinary claims. His series of articles entitled “Lies in Assyrian” [Yalanlarin Suryanicesi] warrant attention and they are subject to another paper. However, suffices to say that Ince sets out to confuse Turkish readers mixing half-truths and fabricated facts and wildly exaggerated assertions. This is not to say that all the Turkish media behaves in this way. In fact such newspapers as Cumhuriyet  and especially Radikal  occasionally publish articles, which question the wisdom of denialism and report on the plight of the minorities. Nevertheless, the role of the media is on the whole a negative one. R. Donef, “Assyrians in Turkey: Disappearance of a culture?”, Assyrian Australian Academic Journal, Sydney, 2000. ‘Press Statement by Prime Minister H.E. Bülent Ecevit Concerning Turkish Citizens of Assyrian Origin’ quoted in R. Donef, ‘The Assyrian Genocide and Article 312 of the Turkish Penal Code: the case of an Assyrian Priest in Turkey’, op.cit. Anon., ‘Süryanilerde bölücü oldu’, Özgür Politika, 22 February 2003. Anon., ‘Midyats Borgmästare är inte trovärdig, [Midyat’s Mayor lacks credibility], ACSA Betnahrin info, (https://www.acsa.nu/), 27 May 2003. S Guesten, ‘After decades in exile Assyrians to rebuild native village’, [Translated from German], Sonntagszeitung, 18 May 2003. S. Barmano, ‘Assyriska Riksförbundet i Sverige: Rapport från resan i Ankara’, [Assyrian Federation in Sweden: Report from trip to Ankara], ACSA Betnahrin info, (https://www.acsa.nu/), 2002. R Donef, [Translation from Turkish with explanatory notes], ‘Assyrians may be recognized as a minority in Turkey’, Hujådå, 18 March 2002. M. Cano, ‘Türkiye azinliklilarinin kurumlari’, Görüs, September, 2002.